The demand for electrical energy on the Spanish peninsula in the month of March, after having factored in the seasonal and working patterns, fell 0.2% with respect to the same month last year. 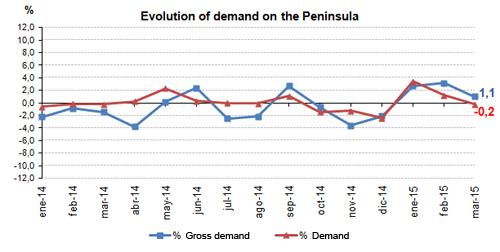 Gross demand for the month was 21,145 GWh, a value 1.1% higher than the figure for March 2014. In the first quarter of the year, after having factored in the seasonal and working patterns, consumption was up 1.5% on that of last year. The gross demand for electrical energy in this period was 64,813 GWh, 2.3% more than in the same period in 2014. Production coming from wind power during this month reached 4,903 GWh, 2.9% down on the same period last year, and represented 22.5% of the total production. 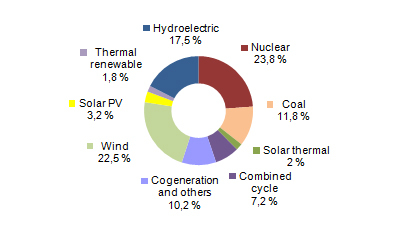 In the month of March, generation coming from renewable energy sources reached 47% of production. 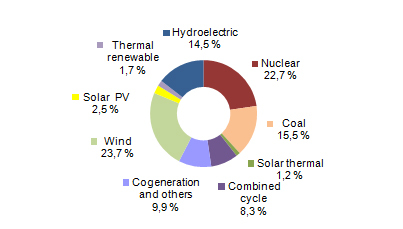 69% of electricity generation during the month was obtained using technologies which produce zero CO2 emissions. The Press Office of Red Eléctrica publishes all written and visual information via the Twitter account RedElectricaREE.